Motion Metrics specializes in advanced monitoring solutions to improve safety, efficiency, and productivity in mining. With over 15 years of experience perfecting rugged machine vision and sensor-based solutions, we apply artificial intelligence and deep learning techniques to deliver exceptional results. Motion Metrics offers innovative solutions with a focus on safety and cost-effectiveness. Its products perform missing tooth detection, tooth wear monitoring, rock fragmentation analysis, payload monitoring, and proximity detection to prevent site accidents, minimize machine downtime and ensure mine efficiency. Motion Metrics products include ShovelMetrics™, LoaderMetrics™, PortaMetrics™, and BeltMetrics™ – suite of advanced monitoring solutions that mining operations can use to optimize productivity from mine to mill. All of these solutions are designed to seamlessly integrate with MetricsManager™ Pro, a centralized web-based platform that aggregates and analyzes data from installed Motion Metrics systems. 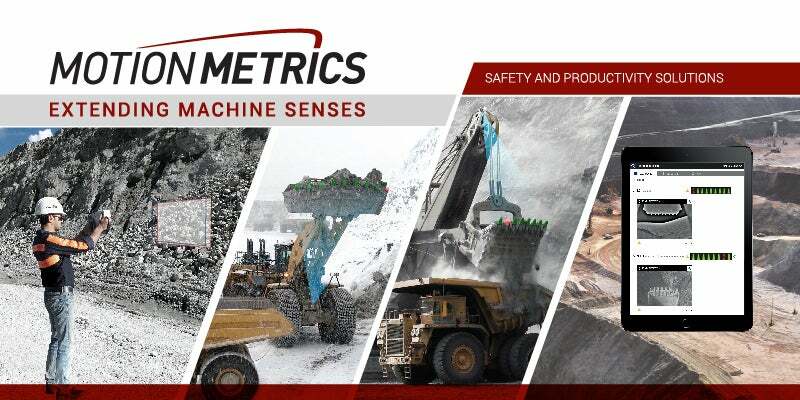 Our flagship product is ShovelMetrics™, a complete monitoring solution for shovels and excavators that uses the latest in machine learning and computer vision to provide missing tooth detection, tooth wear monitoring, fragmentation analysis, payload monitoring and proximity detection. LoaderMetrics™ also monitors bucket teeth using thermal imaging technology and machine learning algorithms in addition to providing proximity detection. ShovelMetrics™ and LoaderMetrics™ are designed to maximize the amount of useful data collected by mining machinery while minimizing workplace hazards, equipment damage, and machine downtime. PortaMetrics™ is a ruggedized handheld fragmentation analysis tool that uses stereo imaging and machine learning algorithms to deliver fast and accurate rock size distribution data without the need for any reference scaling object. PortaMetrics™ enables mine personnel to safely capture, process, and manually alter images of any bench face, stockpile, or quarry. BeltMetrics™ is a ruggedized fragmentation analysis solution designed to analyze fragmentation on mining conveyor belts without interrupting production. Like PortaMetrics™, BeltMetrics™ uses a rugged stereo camera and machine learning algorithms to ensure that every visible rock is scaled and measured accurately. All our monitoring solutions are designed to integrate with MetricsManager™ Pro. This Cloud-based web application provides a single centralized platform to access all Motion Metrics system data. Customizable dashboards allow mine personnel and support specialists to easily monitor the health of each Motion Metrics device. With laptop, tablet, and smartphone compatibility, detailed equipment productivity reports can be easily generated. MetricsManager™ Pro provides real-time equipment status updates, tooth wear prediction reports, shovel productivity reports, and bucket-based rock fragmentation analysis. At Motion Metrics, we back all our solutions by providing comprehensive customer support and we take pride in the ongoing relationships we maintain with our clients. Our engineers travel worldwide to perform everything from on-site installation and commissioning, to training, to scheduled maintenance and performance reports. Fast and accurate particle size analysis is a critical component of any mine-to-mill optimization project, so we’ve developed advanced solutions for the pit and the plant. Recently, we released a new video to show mines how we can help them achieve their optimization objectives. Image-based rock fragmentation sensing in mining and quarry applications includes an important rock boundary delineation step, which is commonly referred to as rock segmentation. This article presents a novel approach to solve this problem, using artificial intelligence. BeltMetrics™ is a ruggedized fragmentation analysis solution designed to measure rock size distribution on mining conveyor belts without interrupting production. LoaderMetrics™ is a missing tooth detection and blind spot reduction system for all loader types. It has been designed to the highest shock and vibration standards and uses thermal imaging technology to overcome poor lighting and weather conditions. MetricsManager™ Pro unifies individual equipment data to a single centralized web-based platform. Mining personnel can access overall equipment summaries, in-depth performance reports and equipment activity logs from anywhere. A patent-pending portable tablet that uses stereoscopic 3D imaging and powerful embedded processing to provide accurate fragmentation information and instantaneous slope measurement in a matter of seconds, without the need for any reference scaling object. ShovelMetrics™ provides a complete suite of monitoring solutions for mining shovels and excavators. With its diverse range of solutions, it allows operators to focus their energy on providing better results for the mine. PortaMetrics™ is a patented* point-and-shoot rugged tablet that provides almost instant fragmentation analysis of your desired scene without the need for any reference scaling object. We provide a range of camera and sensor-based solutions for mining shovels, loaders, conveyor belts, and portable devices. Caitlin McKinnon, Motion Metrics, provides an overview of shovel monitoring solutions and the potential they have for increasing safety and efficiency at mine sites. Three years of 30%+ revenue growth, an office opening in Western Australia, and a new product for mining conveyor belts have all helped Motion Metrics earn a spot on the Silicon Review’s 'Top 30 Fastest-Growing Tech Companies 2018' list. Motion Metrics exhibited at Electra Mining Africa from 10 to 14 September. From 12 to 14 September, Motion Metrics exhibited at ExpoMina in Lima, Peru. Motion Metrics CEO Dr Shahram Tafazoli showcased our revolutionary fragmentation analysis solutions in a presentation at the Future of Mining Conference in Sydney, Australia. Motion Metrics has officially opened an office in Perth, Western Australia, to accommodate growing demand for our advanced monitoring solutions. As 2017 comes to a close, many mines are spending the remainder of their capital budgets on technologies that will help them improve results in the new year – and these purchases are keeping the production team at Motion Metrics very busy. Motion Metrics successfully trialed a LoaderMetrics system at Vale's Voisey's Bay Nickel Mine in Labrador, Canada. Using the latest in artificial intelligence and machine learning, ShovelMetrics™ prevents costly unplanned downtime by providing Missing Tooth Detection and Tooth Wear Monitoring to shovels. ShovelMetrics™ is our flagship solution that has been installed on over 250 shovels at over 50 mines around the world. Motion Metrics is proud to announce its first ShovelMetrics™ systems lease. Motion Metrics has seen record sales of our PortaMetrics™ handheld fragmentation analysis tablet this spring. This winter has been a successful season for ShovelMetrics™ with installations and upgrades at mines around the world. A South African platinum mine is upgrading their existing ShovelMetrics systems to include fragmentation analysis. Motion Metrics is heading to Las Vegas this month to exhibit at CONEXPO-CON/AGG 2017. ShovelMetrics has made a number of installations and upgrades at mining sites worldwide, capping off what has been a successful winter season for the company. On December 27, Motion Metrics was awarded Canadian patent #2,781,349, 'Method and Apparatus for Generating an Indication of an Object within an Operating Ambit of Heavy Loading Equipment', for our ShovelMetrics™ Proximity Detection module. Motion Metrics closed out a successful 2016 with a major sale to a large South African iron ore mine. Motion Metrics is proud to announce a major sale to a large copper mine in central Chile. Motion Metrics is proud to announce that two copper mines in Arizona recently upgraded to our newest version of LoaderMetrics™. The Motion Metrics team has recently returned from ISEE's 40th Annual Conference on Explosives and Blasting Technique in Denver, Colorado. The company unveiled its highly anticipated product, PortaMetrics™, at the conference.